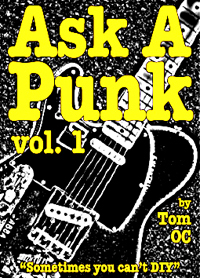 Ask A Punk: Back in the Saddle. 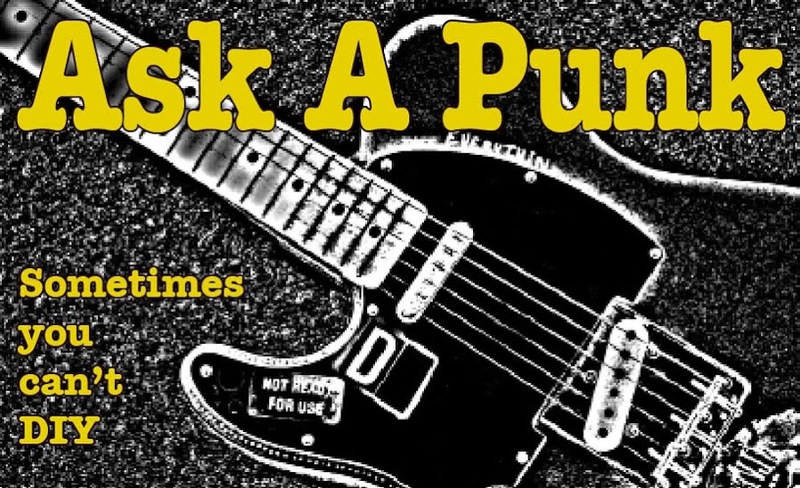 The official weekly return of ASK A PUNK will happen soon. Still working out the kinks in the new eBook - It IS available for download at smashwords.com but some technical glitches are delaying creation of some other file types etc. Should be straightened out soon. Hopefully. Tell your friends, wake the neighbors and fire up those questions. After a brief and much-needed hiatus, I was stunned when I reopened the AAP website and mailbag and discovered a few shocking things: 1) Even with no new posts, tweets or whatever for months, the site was still averaging 500 on purpose visitors per month and 2) People were still sending in sincere emails seeking real answers to their questions. Seeing all that, I knew it was time to get back on the keyboard even though, to date, this website has earned me less than $5.00 in "ad revenue" etc. Obviously this has never been a money-making gig for me. It was, and is, an attempt to do something at least a tiny bit more useful than it is self-indulgent here on the Internet - which is still a pretty rare concept for a blog. So I reopened the website and reacquainted myself with the Blogger platform so I could update the site a bit and make it look/fee a little bit fresher. In a concession to commerce I have done one important thing. As you will discover as you explore the site: The first two years of posts are no longer accessible. I still have about 100 post available for free reading, but if you want to go alllll the way back to the beginning (which I obviously encourage) it'll cost you a whopping $1.99 for the Ask a Punk - Volume 1 "ebook." In it, I collected the best questions and answers from the first year. That's 40+ posts, more than 40,000 words, for less than two bucks. It is now available for every kind of "ereader" out there including your ipad, kindle and nook. At this early stage, I haven't completely figured out how easy or difficult it will be to find my book in all of the online "stores" so, since I used the awesome smashwords.com site to do the distribution, I'm encouraging everyone to start on the book's official smashwords page. From there you'll be able to download it to anything, including your home computer. There are less-than-altruistic reasons for doing this of course. I am hoping to boost my "download" numbers so the book (and blog) can get some notice from the outside world... but I also want to give as many people as possible, especially my regular and loyal readers, the chance to get the book for free and to hopefully write a review of it, either on the smashwords site or (even better) on whatever site they used to buy it. I can't begin to tell you how helpful a few positive words in a short review would be to this whole Ask A Punk endeavor. In other AAP Relaunch news, as you look around the updated site you'll see a few new pages including one labeled "Music+." I'm still not 100% sure what this page will include but I know there are always a few things I want to say that have nothing to do with the week's AAP question, so I'll probably be posting additional non "Q and A" content on this page. What it won't be is a real "reviews" page - meaning I'm not going to waste my time and yours giving negative reviews about things I don't like or am not into. Instead, I'll be sharing things I'm excited and positive about. We'll see what happens. I might even put those "essay"-type posts in the regular AAP blog page, but only as additional content and never as a substitute for the weekly questions from readers. So that's the news. Welcome back everyone. Feel free to start sending in your questions again and please, as we relaunch this whole thing, try to be less shy. What does that mean? It means please post more comments and get more involved. I'll keep hitting my deadlines of course (I can't stop myself) but let there be more feedback. I've never claimed to be the guy with all the ultimate and unassailable answers... just a guy with a reasonable level of common sense and the ability to look at things from several angles. It is good to be (almost) back.